Pink Polka Dot iPhone 5 Case Just $1.88 (Reg. $9.88)! You are here: Home / Great Deals / Amazon Deals / Pink Polka Dot iPhone 5 Case Just $1.88 (Reg. $9.88)! 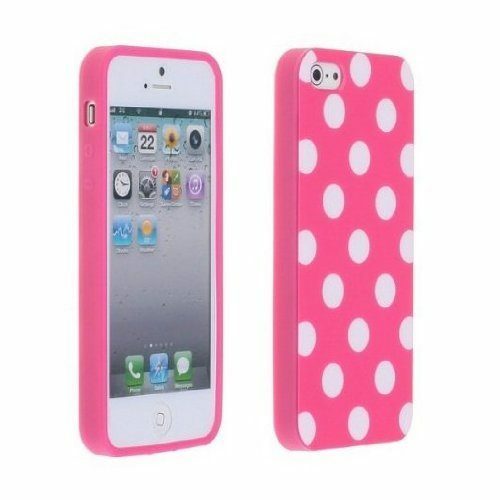 Pink Polka Dot iPhone 5 Case Just $1.98 (Reg. $9.88)! Have an iPhone 5 and want a new, cute case? I’ve got just the thing for you! This super cute Pink Polka Dot iPhone 5 Case is just $1.88 (reg. $9.88) with FREE shipping! If I had an iPhone I’d totally get this one – it’s just my style! Now, I need to find one for my phone! Custom made to comfortably fit your iPhone 5/5S. Special (Thermoplastic Polyurethane) TPU provides the strength of hard case while providing flexibility and durability of a silicone case. It can be twisted without cracking. Full body case that covers the back and side of the phone for optimal protection. Constructed with the use of non-toxic high-quality non-slip material.